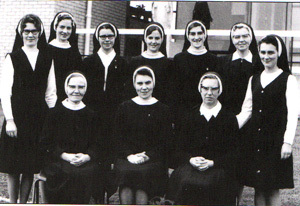 Cnoc Mhuire Secondary School was established in 1947 by the Sisters of Mercy, opening its doors to the girls of the surrounding area. The school enrolled boarders in 1947 and continued to do so until 1987. 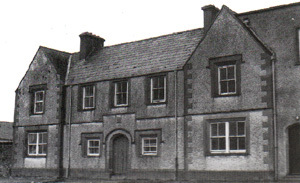 In 1959, Cnoc Mhuire became a co-educational school when 12 boys enrolled out of a first year enrolment of 41. From its inception the school members gradually grew until 1968 when the introduction of free education led to a surge in numbers. To cater for this, a 20 classroom block was built in 1970. 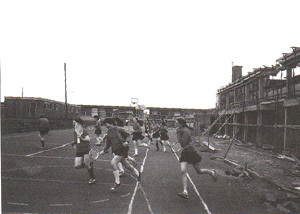 In 1983, a two-storey block containing classrooms and specialist rooms was added. In that year, a sportshall was also built. In 1987, both the Principal and Manager were members of the Sisters of Mercy. In that year, a Board of Management replaced the Manager and in 1996, the first lay Principal was appointed. The Sisters of Mercy, Western Province were trustees of the school at that stage. In 2006, the Sisters of Mercy joined 4 other congregations Daughters of Charity, Presentation Sisters, Sisters of the Christian Retreat, Sisters of Mercy and Missionaries of the Sacred Heart – to establish a trust to run their schools -CEIST -Catholic Education, an Irish Schools Trust. These are the trustees of our school today. The catchment area is a 9 mile radius around Granard town. From small beginnings the school has grown and expanded to its present population of 449 students and 40 staff, comprised of teaching, administrative and maintenance personnel. For the 1997 Jubilee Year of the School a special magazine was produced which can be downloaded on the Magazine page. This gives a very detailed history of the school including images from as far back as 1947. Writing an account of Cnoc Mhuire, its beginning, its growth and development would be incomplete without reference to the Mercy Order and the coming of the Sisters of Mercy to Granard. Catherine McAuley, who founded the Sisters of Mercy, was born in Dublin in 1778, a city of Grattan’s Parliament, but also a city where the vast majority lived in destitution. Unemployment and destitution were harsh facts of life. She, as a wealthy heiress could have turned her back on the abject squalor and poverty around her, but she, as a lay woman, in 1827 established a House of Mercy in Baggot Street, where she and her companions provided clothing, care, shelter and education for many of Dublin’s poor, sick and orphaned people. In response to God’s call she became a religious sister and on the 12th of December 1831 she laid the foundations of the Congregation of the Sisters of Mercy, with the house in Baggot Street as its first convent. Since then thousands of women have been drawn to this Mercy way of life and have gone as Mercy sisters to the four corners of the globe, as well as to all parts of Ireland. In 1861 the Sisters of Mercy first carne to the Diocese of Ardagh and Clonmacnois. The history of education in Granard is interwoven with the history of religious sisters who called to make their home in the town. As early as 1861 the Presentation Sisters had come from George’s Hill Convent in Dublin and resided in Springlawn House, formerly owned by Pettits. The outhouses attached to the dwelling house were converted into school rooms where the sisters taught until 1881 when they left and went to Portadown, Co. Armagh. In 1881 the then Parish Priest of Granard. Dean 0′ Flanagan, asked the sisters in Newtownforbes to send some sisters to Granard. At that time there was a Workhouse in Granard which was established in 1842 to relieve the poverty of the people, but like so many similar ones in the country it brought only endless suffering and misery. The records of 1850 show that there were 269 males and 417 females enrolled, a total of 686 pupils with one male and one female teacher. It was to this workhouse on 2nd of February 1882, one hundred and fifteen years ago (115), that six sisters were sent to Granard from Newtowntorbes three to nurse in the Workhouse Infirmary and three to teach in the Workhouse schools. Later on, these sisters moved into Springlawn and taught boys and girls in makeshift classrooms. Later lace making and domestic skills were taught to older girls. The sisters, were very poor, at times scarcely having enough to eat, but they were supported by the generosity and kindness of the people of Granard. In 1891 with the generous co-operation of the priests and people of Granard, who organised bazaars, concerts, etc. the Convent Primary School was built on a the spacious site. It was here that the sisters taught all the years. They still continue to serve the educational needs of the town in a modern building, which was erected in 1977. The workhouse was closed in 1922 and all the buildings were demolished except the master’s lodge. Mother Dolores Finnegan, who was superioress of the convent, was the inspiration behind the setting up of the secondary school. She sent Sr. Clement and Sr. Patrick to Galway University in 1940 to study and they completed their degrees: B.A; B.Comm and Higher Diploma in 1944. During these years girls stayed on in school until they were 15, 16 or perhaps 17 years of age. In 1942 the Sisters had continuation classes set up for these girls in the workhouse lodge. They did the usual subjects “with special emphasis on cookery, needlework, arts and crafts. At this time the primary school inspector suggested to Mother Dolores to set up a Secondary Top but with our sisters fully qualified, it was decided to set up a secondary school. The sisters had the lodge fitted with every convenience and spared neither time nor money in making it ready to receive the first pupils. So, it came to be that Cnoc Mhuire was born and opened its doors to the children of the area. Mother Dolores was urged to open Cnoc Mhuire. Because of her great desire to help youth. She was Principal of the primary school from 1915 and wanted to provide secondary education for the many young girls who left the primary school. Her strong desire to foster vocations to religious life. She was successful in both of these and year after year many girls entered the local convent and other congregations. Some found themselves in far off mission fields too. It was evident that the parents and their daughters appreciated the great boom it was to have secondary education available to them as 24 girls enrolled on the opening day, 1st of September 1947. Many girls were from the town but girls cycled from Mullahoran, Loughduff, Finea, Streete, Mullinalaghta, Colmcille and Gowna and they continued to do this until free transport came. It wasn’t an easy task to face the elements each day on one’s bicycle but this they did. A small fee of £4 was paid annually, and the uniform consisted of a black gymslip and blue blouse and tie. The school was a Grade A school which meant that all subjects and courses were taught through the medium of Irish. This continued up to and for some years after the introduction of free education in 1967, when it was felt that increasing numbers of incoming pupils were unable to follow satisfactorily and successfully the courses through Irish. Sr Clement, (who was the first Principal and who continued as principal for twenty five years) and Sr Patrick got their fIrst salaries of £36.10 each in November 1948, fourteen months after opening the school! The first capitation grant of £102 was also paid by the Department of Education the same month. Financial resources were indeed minimal in those days, but whatever resources the community possessed were made available for the upkeep and development of the school. These were lean, hard, struggling days and years and to those pioneers in the field, we owe a debt of gratitude. Each year the number of pupils increased and the first Inter Cert examination was held in 1950 and the first Leaving Cert in 1952. The students took the usual subjects but we must recall that in those days Arithmetic, Algebra and Geometry were separate subjects and Physiology was studied instead of Biology. The school week was longer too, as classes were held on Saturdays until one o’clock. Drill classes followed given by a Mr. Medler, a trained PE. instructor. For many years Sr Clement and Sr Patrick were ably assisted in the school by Sr Teresa, Eucharia, Aloysius, Mel and Kathleen who taught English, Mathematics, Art, Domestic Science, Physiology, Music and Religious Knowledge. As time passed they were joined on the staff by Sr. Regina, Keena,Judith, Maeve, Maria and Mary Doherty, all past pupils of the school, and by Sr. Joan and Josephine. There was a small boarding area provided in the convent for girls in 1949 but with the increasing demand for boarding and classroom places the sisters extended the school in 1954/ 1955 by adding a new wing which consisted of a large assembly hall/ classroom (now a Gymnasium) and overhead, a modern spacious dormitory with forty individual cubicles (now three spacious classrooms). Again, all this was totally financed by the community. Numbers continued to increase and the records show that 25 first year girls enrolled in 1958, but another milestone in the history of Cnoc Mhuire took place in 1959. At that time representations were made by the people of the town to the Bishop to provide secondary education for boys. After much discussion between Bishop McNamee, Dean 0′ Kane P. P. and the sisters the parents saw their dream realised when the sisters accepted the challenge to accept boys into the school. In September 1959 twelve boys enrolled bringing the first year enrolment that year to 41. Many of the boys were from the country areas and cycled many miles like the girls in order to avail of secondary education. Cnoc Mhuire was among the first Co-educational school in the country and has so continued down the years. To cater for these increasing numbers it was necessary to erect more classrooms – this time prefabs and St Marie Goretti’s classroom. Up to this time the State did not provide any Secondary Education. Whatever schools or colleges were available were established by religious orders and by the Diocesan Bishops and Priests. Many parents were not able to pay boarding fees and it was only those who could afford to pay even a small fee, who were able to avail of secondary education as day pupils. But none was ever turned away because of a financial problem. In 1967 things changed. The then Minister of Education Mr Donagh 0’Malley announced his plan to provide free second level education and free transport for all. This, no school was ready for. In 1966 our first year enrolment was 64 and in 1967 it was 85 with thirteen extra students corning into the senior cycle from other schools. In 1968 the first year enrolment was 93 with 16 coming into other classes. So the flood gates were opened and major expansion work was necessary. For many years Sr Clement was asking the Department of Education for a new school, but nothing happened, but one day, when a Department Inspector saw over a hundred pupils emerging from a dilapidated building (formerly Hayden’s Pub), it put him thinking. Eventually the go-ahead was given to build a large one storey 20-classroom block. That was in 1969 and the building was completed in 1970, at a cost of £96,000. The Department only paid 70% grant, so 30% of the total cost had to be borne by the community. Silver Circles and Concerts were organised to help defray the debt. In the seventies the number of pupils continued to increase. In 1975 the first year enrolment was 110 and in 1980 it was 105 and by 1981 it had gone up to 112, with over 470 pupils on rolls. Once again we were faced with congestion problems, so after years of pressure, a two-storey block was approved in 1981 and was built in 1982-83. 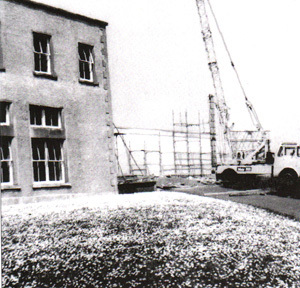 Old Cnoc Mhuire was demolished at that stage and the new extension covers part of that area, There were not only extra classrooms and laboratories, cloakrooms and a spacious music room, but also an oratory, a computer room and a career guidance room. A sportshall was also built at that stage, one of the finest in the country where all the indoor games are played in comfort. All this block was only 80% grant-aided and a heavy debt remained. There were many and varied efforts to try to reduce the debt, and thankfully, the remaining debt was cleared by the generosity of the Mercy congregation. Enrolment fluctuated somewhat in the eighties but there has been a steady increase each year and in 1996 the first year enrolment was 90. The nineties brought another phase which was the re-roofing of the one storey block and the carpeting of all the classrooms. This has been a great help and has contributed greatly to the warmth of the building. The dormitory was vacant since the late eighties when the boarders were phased out. This was converted into three fine classrooms, which give even more space for classes. Each teacher has his/her own classroom which has many advantages. In the Autumn of 1996 all the windows in the assembly hall, dormitory area and in the one-storey block were replaced by PVC double-glazed windows – a really fine job. The weekly lotto has been organised over the past few years to help defray the outstanding debt. The roofs on the two storey block and dormitory need to be replaced when the Department gives the approval. As well as the many building projects that had to be faced much was happening and many changes took place within the school over the years. At the beginning the school was staffed by sisters only. Other sisters joined the staff in the late seventies and early nineties and some sisters were transferred to other convents. It was not until 1967 that the first lay teacher was employed. Now we have nearly all lay staff, all doing a fine job. From the early fifties right down until the boarding school was phased out, study facilities were available each evening not only for the boarders but for the town students as well. There were also sessions on Saturday and Sunday mornings. Saturday school discontinued with free education and free transport. No buses were available on Saturdays. The students were always supervised by a sister and the facility was greatly appreciated by parents and students. Another interesting development was the co-operation that took place for many years between Cnoc Mhuire and the local Vocational School (now Ardscoil Phadraig). Geography, English, History and Language teachers from Cnoc Mhuire taught those subjects in the Vocational School, while teachers from the Vocational School taught Commerce, Accountancy, Science and Biology in Cnoc Mhuire. This was a very satisfactory arrangement and ran very smoothly until the respective teachers were required in their own schools because of growth in numbers.